"Seeing is believing, but sometimes the most real things in this world are the things we can't see. " Since its publication in 1985, Chris Van Allsburg's The Polar Express has become an acknowledged classic of children's literature. It is a yuletide tale about faith and hope made unique not only because of the thoughtfulness of the tale but the author's distinctive illustrations as well. The pictures in the book have become recognizable to young readers and at first thought the notion of turn ing them into a film seems like a doomed idea. However, director Robert Zemeckis is up for the challenge, and from the first frame to the last, Zemeckis makes his own mark on a beloved children's story and manages to ensure it will last for the ages. On Christmas Eve, a young child struggling with the knowledge that Santa may not in fact be real is startled by a loud sound coming from beyond his bedroom. After rushing from his bed, he is surprised to see a large black locomotive and a conductor (Hanks) asking him if he is coming along for the ride to the North Pole. After a some trepidation, Hero Child (Sabara) boards the Polar Express dressed in his pajamas and slippers. Along the way he meets other children along for the ride to Santa's home, including Hero Girl (Gaye), Know-It-All (Deezen), and several other interesting individuals. The children experience fantastic adventures including a descent down a steep cliff aboard the locomotive, a rekindled faith in Christmas, and the wondrous North Pole. It's a fairly simple story, and Zemeckis and screenwriter William Broyles Jr. have had to add elements to Van Allsburg's story to get the film up to feature length as the story is only 29 pages including many illustrations. Luckily, they succeed more often than they fail. Among the successes are the inclusion of a poor boy whose faith in Christmas and his family has been shattered, plus some lively songs and a tremendous sequence in Santa's toy factory that proves almost as thrilling as any roller coaster. The film tends to rely a tad too heavily on thrilling sequences, which threatens to obscure its heartfelt theme at times, but overall it manages to maintain the majesty and innocence of Van Allsburg's story. The film is a visual delight; a revolutionary new process used by Zemeckis, called "performance capture" pushes computer animation in a fascinating and daring new direction. All of the main roles, including the young boy, his father, the conductor, a hobo on the train, and Santa Claus are brought to life by Tom Hanks, whose movements were recorded by 72 different cameras, all running at once. The images were then fed into a computer, adjusted, and integrated into an elaborately rendered world drawn to resemble Van Allsburg's work. The result is truly spectacular: The Polar Express treats the viewer to crystal-clear animated sights that are eerily realistic. At times the animation is, well, a bit creepy, but with the amount of heart emanating from the story it is easy to overlook this one small flaw. 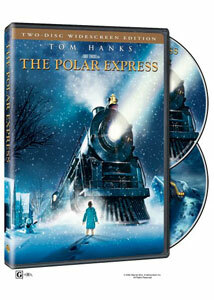 As I watched The Polar Express I became immersed in the experience of it. It will be hard for any adult to not get caught up in the ride just as much as a small child would. Zemeckis has crafted not only a technical masterpiece but also a film that is wholesome and winning and sure to fill anyone's heart with Christmas cheer. Image Transfer Review: Presented in the original 2.35:1 anamorphic aspect ratio, The Polar Express manages to offer a marvelous presentation on DVD. To call the transfer flawless may be too much, but it comes very close. There is no edge enhancement or grain, just stunning color and depth throughout. Sharpness and detail enhance the already terrific computer animation. The bright palette of the film comes off very well with no bleeding at any time—even the bright lights of the North Pole twinkle with no edge halos or grain. Audio Transfer Review: The Dolby Digital 5.1 mix is just as stunning as the visuals with the mix creating an amazing amount of range. From the first rumbles of the express at the start of the film to the hurried activity at the North Pole the mix is constantly alive. Split surrounds are used effectively and are not showy while the dialogue is crisp and clear as can be. Extras Review: As is becoming the norm with Warner Bros. releases, The Polar Express arrives in both a single-disc edition and a two-disc special edition. The lone extra on the first disc is the film's theatrical trailer; while a commentary would have been great we are sadly not treated to one. Although the extras on the second disc may seem like a lot, the collection is merely a group of small featurettes lasting an average of three to four minutes each. For a film with as much visual inventiveness as this, I would have liked to have seen more in-depth discussions about the crafting and completion of the film, but what is offered does its best in a scant amount of time. There are discussions on the motion-capture techniques via interviews with Hanks and Zemeckis in You Look Familiar. Performance Capture is no more than an extension of the previously mentioned featurette but offers a little more information about the process used to convert the actors to animation. Other brief pieces include a look at the Virtual Camera, which looks at the tools used to craft shots and sequences, while Hair and Wardrobe showcases how the animators managed to craft realistic hair and clothing for the film. Creating the North Pole covers how the filmmakers came up the design and layout of Santa's home while Music presents the creation of the score and songs by Glenn Ballard and Alan Silvestri. Singer Josh Groban is showcased in a live performance of his song, Believe, in a look at the creation of the film's closing song. Finally, there is a series of set-top games but being the 28-year-old I am, I am clearly out of the demographic and could not figure them out for the life of me. The Polar Express will become a holiday tradition in my household as, more than any other film, it manages to evoke the spirit of Christmas while completely enthralling in nearly every aspect. Highly recommended.